Good morning everyone and happy Thursday, only one more day until the weekend! It's around 6 a.m. at the moment and I have quite the long day ahead of me, but with a coffee in hand, anything is possible! #amirite - Ironically, I cant think of a better time to post about these super green balls because they are perfect for an early morning/long night type of day. And luckily today is going to be a little bit of both for me! For those of you who have been following me for a while, you might know how much I love the Red Hot Chili Peppers (yes, both the food and band y'all) - well, Chad was able to get us tickets for a concert in Pittsburgh.. TONIGHT! We're going to head into the city this afternoon, grab some lunch and then maybe power nap it out because the concert doesn't start until 8, and I'm usually in bed by 9 (oops). I knew today was going to be a long day (getting up at 6 was not part of the OG plan) so I decided to put together this easy and tasty recipe to keep us going all day/night! I love bringing snacks whenever we go on trips, a. to save money and b. to ensure we always have something that fits our lifestyle to munch on. Since balls are Chads fav, and clearly mine too, I decided to go with something that had a good amount of healthy fats, some protein for good measure, and of course that decadent fudgey flavor. 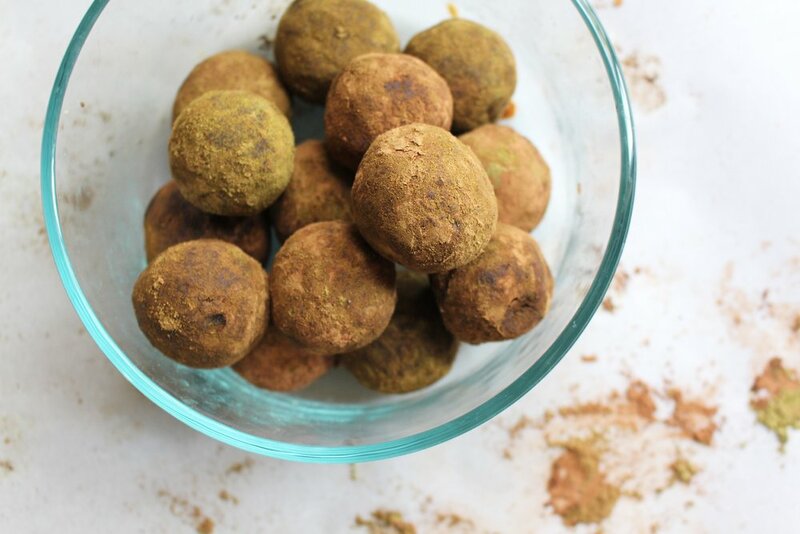 Rest assured, these Green Cacao Energy Balls are everything and more! Using a food processor, combine all of your ingredients and mix on high until a sticky, ball like batter forms and easily comes away from the sides. You should see little "pearls" or pebbles form and that's when you know its ready! Using your hands, roll your batter into 18, one inch balls and place on the parchment paper. Bigger balls means less balls and is completely optional! Once rolled, place in the refrigerator for 10-15 minutes until firm. 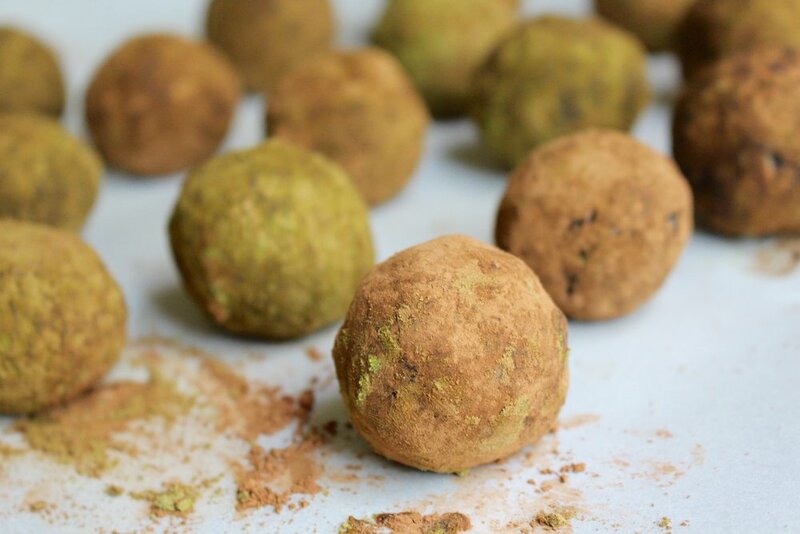 If you choose to roll your balls in the final coating, prepare a small plate with both the cacao and hemp powders. Roll each ball until they are nice and evenly coated and place back into the fridge for additional cooling. It's time to enjoy! These balls will store for up to one week in an air tight container and I suggest keeping them in the fridge. I have stored these in my freezer for longer periods of time and they were still just as great!